There are many questions about the Atkins diet and pregnancy, and if it is healthy to use such an extreme diet when expecting. The good news is that it is possible for some expectant mothers to follow the maintenance phase of the Atkins diet plan, just follow a few common sense tips. You want to give your body and your baby the proper amount of fat, proteins, and nutrients you both need by eating sensibly while still allowing your body the fuel carbs it needs. When you are pregnant you need to eat about an extra 300 calories a day, but not much more than that. The weight you gain during pregnancy isn’t fat and flab. Your body is producing extra fluids and blood (more than 2 liters) for the baby’s needs. The best approach is to gain a healthy, normal amount of pregnancy weight but nothing in excess. To find more information about “eating for two,” check online for Atkins Diet Pregnancy forums and support groups to get nutritious meal planning and snack ideas. Who is showing love for those desired carbs? You or the baby? Or both? Carbs are a source of nourishment for unborns and as such should make up about 30-40% of your diet. During the first few months of pregnancy, carb cravings can seem out of control, especially when a wave of nausea hits and other foods, especially meat, don’t sound appetizing. Hopefully, you will desire good carbs found in fruits, vegetables, whole grains, and nuts, and can resist bad carb foods such as bakery products, sweets, and sodas as much as possible. Anyway, cravings are your body’s way of telling you what it needs. Sour foods help with nausea and cravings for salty foods, sweets, and carbs will likely deliver what your body is in need of at that moment. The Atkins diet and pregnancy can be combined successfully, but it is strongly advised that pregnant women do only the maintenance phase of Atkins, which allows for a healthy, controlled number of carbohydrates daily. In fact, Dr. Robert Atkins stated that the induction phase of the plan is not appropriate for expectant mothers. 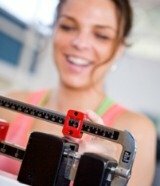 The idea is not to lose weight but to maintain a proper weight in relation to your body’s needs. 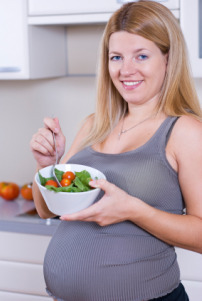 It is also important that pregnant women eat a healthy balanced diet that includes vegetables, fruits, and grains in order to avoid constipation, a condition that is associated with low carb diets and can create special problems during pregnancy. If you have questions or concerns about the Atkins diet and pregnancy, you should consult with your obstetrician before starting any new plan. Your doctor can advise you of a preferred nutrition approach based on your own health and that of your unborn baby.